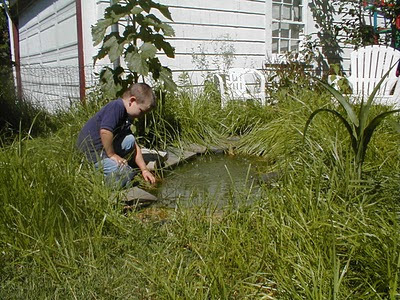 Need to get nature study jump-started in your own back yard? Here are a few suggestions! 1. Let the grass grow a bit and do a lawn study. Do you know how many different plants and animals are in a small patch of lawn? Let a small section of your lawn grow and do a succession study. What is growing there after a year? After two years? I can’t tell you how many school children believe that if only we let the grass grow tall enough, it will turn into trees. A succession area will show your children that other plants arrive on your lawn in a variety of ways, not through instantaneous evolution or spontaneous generation. 2. Start an open compost pile and watch things decompose. An open compost pile, not a new-fangled bin, will reveal the mysteries of decomposition, and provide more learning opportunities than you imagine. Last year, a surprise pumpkin patch grew in our compost pile, and I remember a watermelon growing out of my grandmother’s compost pile when I was a child. This year, Yukon gold potatoes are thriving on the edge of the pile. Compare gardening with composted soil, and gardening without it. 3. Plant a garden with vegetables or flowers. Know the names of the plants. Plant something big, like giant sunflowers of pumpkins. Plant something small, like one of the new hybrid eggplants or berry tomatoes. Plant something native to your area, or plant something exotic. If you have a small yard, or no yard, can you visit a relative with more room? I grew up in an apartment, but my grandma Kerr always planted a fragrant flowerbed at her house, and my grandma Collier always had a bountiful vegetable garden. 4. Make your yard a haven for wildlife. Put up bird feeders or nest boxes. Add a birdbath as a water source. Tame the birds—it’s not hard, and the tame birds will provide you with ours of enjoyment through the winter! Try bat boxes, or butterfly boxes, too. Ladybug and toad boxes are also becoming common. Perhaps the kids can design a shelter to attract other wildlife. A simple brush pile may encourage rabbits to move in. If you live in an apartment, look for creative ways to bring nature closer…a nest box on a fire escape can bring a surprise guest! 5. Place large stones or logs in your yard. Let the kids peek under them from time to time. Worms, pill bugs, centipedes and other invertebrates, and some vertebrates like salamanders and snakes, will find a haven in your yard. 6. Know what’s in your yard. Know the kind of grass on your lawn. Know the trees on your street. Learn the names of the animals and mushrooms. Know which of the plants in your yard are edible, and which are not. 7. Add a water garden. These are easy to build, with kits available at garden centers. The sound of running water may bring the unexpected to your yard. Within two hours of turning on our small pond fountain, our first red-winged black bird stopped by for a drink. Since then, hundreds of birds have stopped by our urban plot. 8. Place stepping-stones through the gardens in your yard. Kids like to step on the stones, hopping from one to another, and they will help to keep young plants safe from stomping feet. Place them in patterns, or randomly. Even my big kids don’t seem to tire of hopping from stone to stone around our pond. 9. Set up a small weather station with a thermometer and weather vane and barometer so the kids can predict the weather, correlate the wild visitors in your yard with temperature, pressure and wind velocity. 10. Finally, let your children dig in your yard. Set aside an area where they can dig for treasure, or take soil samples. Perhaps your older children can set up an archeological dig . We found old nails, hinges, and even a piece of "ancient" vacuum hose when we did our dig! See Dig magazine for more fun. Need more ideas? Discover Nature Today! These are such wonderful suggestions! I am saving this when we get back to the states! Do you have any ideas for Nature Study at home when you don't have a yard? We can't really go exploring too much here because of poisionus snakes and spiders so I up for in home nature study. My grandmother's maiden name was Collier. I wonder if she was any relation to your grandmother.